Leftover Mexican food provides a deceivingly complex base for sunny side up eggs! Simply cook the leftovers (in this case, refried beans and half an enchilada) on low and then crack eggs over the top and cook covered until set. All the flavors of the original dish are enhanced by the runny eggs. Tastes fancy, but it’s fuss-free. My obsession with sunny side up eggs on just about anything shows no sign of stopping. This time around, I conquered otherwise-tough barley and runny-just-right eggs. Redemption is sweet! The trick is to cook the barley in advance, and keep the temperature very low as the eggs cook on top of the barley (covered) until desired doneness. 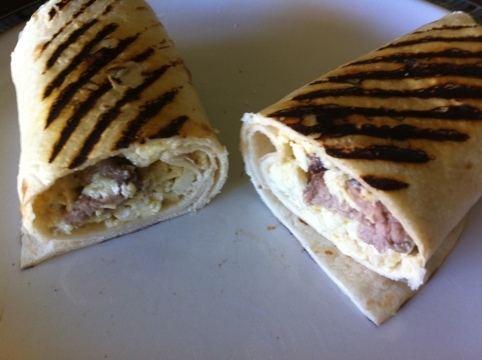 Last night’s steak from Parkside Grille + eggs + tortillas + grill pan = breakfast burritos. Yum! The result was a deliciously creamy potato, egg, and vegetable casserole. Divine!